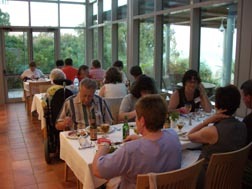 We are now at the Pilgerhaus Hotel on the shore of Galilee. 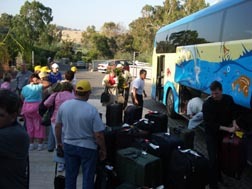 The pilgrims arrived safely — though a bit tired — and full of excitement. We drove north past Tel Aviv (ancient Joppa) and through central Israel past Nazareth, Meggido (Armegeddon of the book of Revelation) and many other places on our way to the Sea of Galilee and our hotel. We had a wonderful dinner overlooking the Sea, the Mount of Beatitudes and Tiberias, celebrated Mass for the solemnity of the Sacred Heart of Jesus and then, everyone scattered — some to catch up on sleep and others to explore along the shores of the sea in the dark. Nick Russell was even out catching crabs that were scrambling around on the rocks. Eveyone seems very happy and pleased so far and they LOVE this location. We have a great group of 50 pilgrims who are devout, excited, educated and full of fun and enthusiasm. For the vast majority it is their first time to Israel so this is GREAT fun for Janet and I to introduce them to this holy and sacramental land. Even though they were all tired from flying for over 24 hours and even though it was hot in the chapel overlooking the sea, all of them came to Mass and loved it. Fr. Gerald is wonderful and already endearing himself to the group. Previous post: They are Landing!